Of course, this was an entirely sarcastic look at the world of SEO (or whatever we’re calling it these days). This was created using Piktochart, found via this great little blog post on 10 Tools for Creating Infographics and Visualizations. Good post, now that I know of this “keyword tag” you speak of, maybe my rankings will soar! It’s all a lot of nonsense. Been working in the field for a few years, and still haven’t a clue. Just a way to bilk companies of their money, in my estimation. Not complaining, mind you. Haha. SEO is pretty subjective, so it’s still pretty common for companies to be ripped off, which is annoying. SEO is all about getting high ranking in the search engines and everyone is trying his best to win the race but only those win who follow the rules and regulations on Google because Google algorithm have a strict check upon each activity. 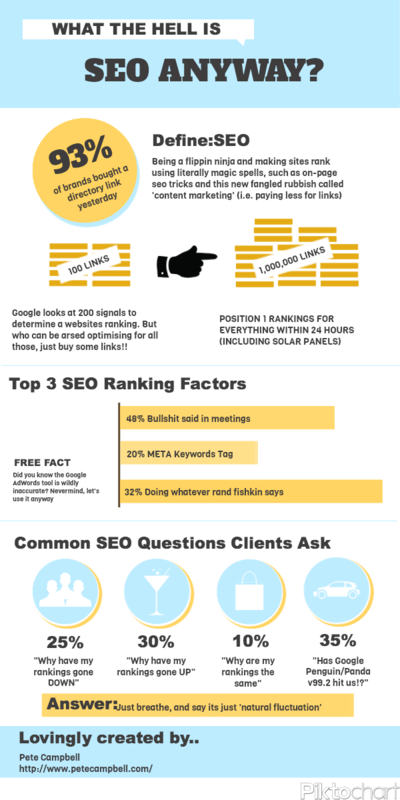 Well good infographic elaboration of SEO real factors.